Art of Range Hoods’ Estella Range Hoods have the unique ability to appeal to all types of personalities. 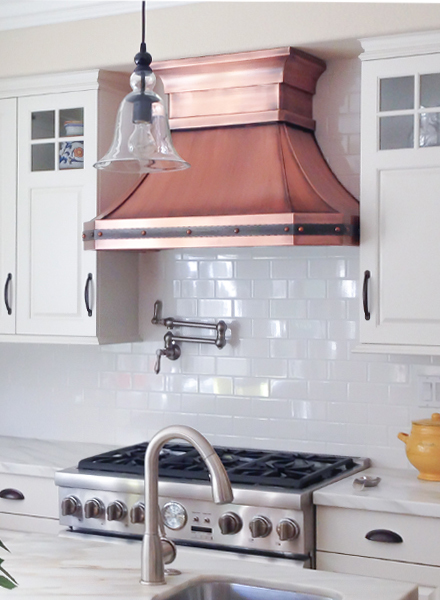 Standard features of our Estella Range Hoods include copper crown molding and one continuous horizontal strap. Add two front vertical straps to customize your range hood. You may also choose your patina color in light, medium light, medium or dark patina. We finish our Estella Range Hoods with a natural style lacquer that is neither glossy or matte, just flat. If you would like to discuss further custom options, or need help through the ordering process, give us a call at 360-891-6540. Our office house are Monday – Friday, 8am – 5pm (PST). Our friendly and knowledgeable reps will help you every step to achieve your perfect range hood! At Art of Range Hoods we pride ourselves on creating custom range hoods, made to order. No two range hoods are the same, guaranteed.